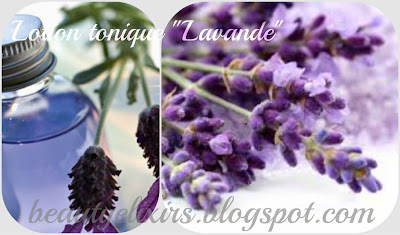 Lavender is a valuable herb with strong healing properties. It is used against stress and anxiety as is is a natural toner. Its essential oil has potent antiseptic and healing properties, it soothes, balances and refreshes the skin and is also useful for wasp or bee stings. It is also analgesic and antiseptic, suitable for treatment of small burns and acne. Its aroma is one of the noblest scents in nature providing a feeling of purity, freshness and relaxation. Prepare a herbal tincture using lavender buds and vodka. Prepare a herbal tea using lavender buds and distilled water. In a glass bottle mix the two liquids and add the essential oil and the liquid soap. Allow the mixture to mature for 1 day. If you don't have a preservative then prepare a smaller quantity and store your toner to the fridge. This facial toner is refreshing & soothing, ideal for combination and oily skin.